I moved to Chicago in July of 1995. For those from Chicago, they recognize that date as the middle of one of the worst heat waves in Chicago’s history. Sean lived in a tiny apartment with no air conditioning. Experiencing heat and humidity far beyond what I was accustomed to, I was miserable. Hour after hour, I longed to go, as quickly as possible, back to the west, where a humidity of 8% caused gripes and grumbles. But, I toughed it out. A month later, we moved from Sean’s bachelor apartment in Rogers Park to a larger, one bedroom apartment a few blocks away. To beat the heat, we spent a lot of time at a movie theater on Sheridan called The 400, which had air conditioning. We also spent a lot of time in the lake, which was half a block away. A month after that, we adopted Equus and Elijah and the Warehouse, our family, was complete. Over the years, Chicago has become my home. While I do not consider myself a Midwesterner and probably never will – I’ll always be a Westerner at heart – I do consider myself a proud Chicagoan. So many things define Chicago for me. Chicago is architecture, diversity, epic in size, a city of outdoor art, museums, music, beautiful, great food, ethnic neighborhoods, colleges, water, history, politics…I could go on and on. This year, I added something significant to that list: Chicago is a wild space. 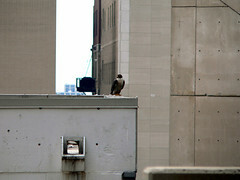 I never considered I’d be watching and studying birds of prey from the top of a 12-story downtown garage. So, I guess I want to say: Thanks Chicago for never ceasing to surprise and amaze me! ~ by Steph on June 24, 2006.